The Bible frequently depicts God as angry and violent, and sometimes depicts human violence as positive or even as commanded by God. This forms one of the most vexing problems in approaching Scripture and interpreting the Bible for preaching and teaching today. 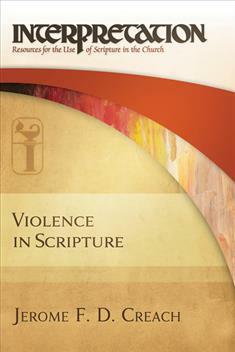 In this volume, Creach first examines the theological problems of violence and categorizes the types of violence that appear in scripture. He then wrestles with the most important biblical texts on violence to work through specific interpretational issues. This new volume in the Interpretation: Resources for Use of Scripture in the Church series will help preachers and pastors interpret those difficult texts, encouraging them to face violence in the Bible with honesty. "Creach models rigorous scholarship within the perspectives of robust faith. He thereby sheds new light on a major contemporary problem. This should enable fresh understanding and confident use of the Bible in Christian ministry and preaching." "Recent critics have suggested that the Bible's narratives and biblical monotheism promote various forms of religious violence. In this book, Jerome Creach demonstrates that such accusations are often based on facile (mis)readings of the biblical text. With theological sophistication, Creach reveals that frequently the texts under discussion contain critiques of the very violence some claim the Bible endorses. Even those who may question some of Creach's interpretations will learn much about how Christians and others can read troubling biblical texts generously and productively." "In his book Violence in Scripture, Jerome Creach investigates multiple aspects of violence as a problem in biblical texts. He draws primarily upon Old Testament passages that appear to condone violence in God and humans. He shows how historical circumstances affect and complicate understandings of violence. He uncovers self-correcting elements of the scriptures that challenge violence of God and of human. He locates violent passages within larger canonical contexts that correct or modify the place of violence. He concludes that God's hopes for humans and the world are essentially non-violent. God created the world without violence, and Jesus brings Old Testament themes of non-violence to fulfillment in the New. Creach's study is clear and insightful, and it promises to provoke thoughtful reflection among pastors, teachers, lay people, and scholars." "Creach demonstrates clearly and convincingly that the Bible is not an inherently violent book (as some suppose) and that it certainly does not authorize violence in the human community. Drawing upon the latest and best historical-critical research, along with canonical perspectives and insights from the history of biblical interpretation, Creach shows that the Bible from its very beginning portrays a God who wills comprehensive peace and well-being for all people and all creation. Given our current culture of violence (in which the church is often complicit), Creach's work is an extraordinarily timely and valuable contribution to biblical theology. It should serve as an indispensable resource for church members and church leaders as we confront violence in self and society, and as we pursue the peace that God wills."